How in the World Do You Wrap a Bike? Few things bring a bigger smile on Christmas morning than when a child sees a shiny new bike waiting for them under the tree. You probably have your own fond memories of getting your first bike on your birthday or Christmas, the most popular times to receive a bike. This year, half of shoppers plan to give sports equipment, and bikes rank high on the list. 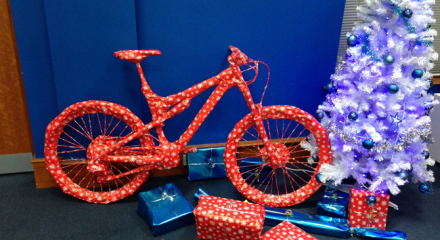 With so many parents giving a new set of wheels, we have to ask, how in the world do you wrap a bike?! We surveyed consumers this year asking just that and found that nearly half stick a big shiny bow on the handle bars and call it a day. Just over one fourth (26%) don’t even bother, while 5% commit to wrapping the entire bike. The only thing more tedious than wrapping a bike is putting it together, a feat one third of consumers attempted to tackle. Alternatively, 51% of shoppers left the heavy lifting to the stores and brought their bikes home pre-assembled. If you plan on giving a new bike this holiday, be sure to get a protection plan. Ask your retailer for more information or visit Asurion.com/extended-warranty/ to learn more.